Venture capital investments continued to grow at a rapid clip in the second quarter of 2011, with VC firms investing $7.5 billion across 966 deals, according to the latest MoneyTree report from PricewaterhouseCoopers (PwC) and the National Venture Capital Association (NVCA.) 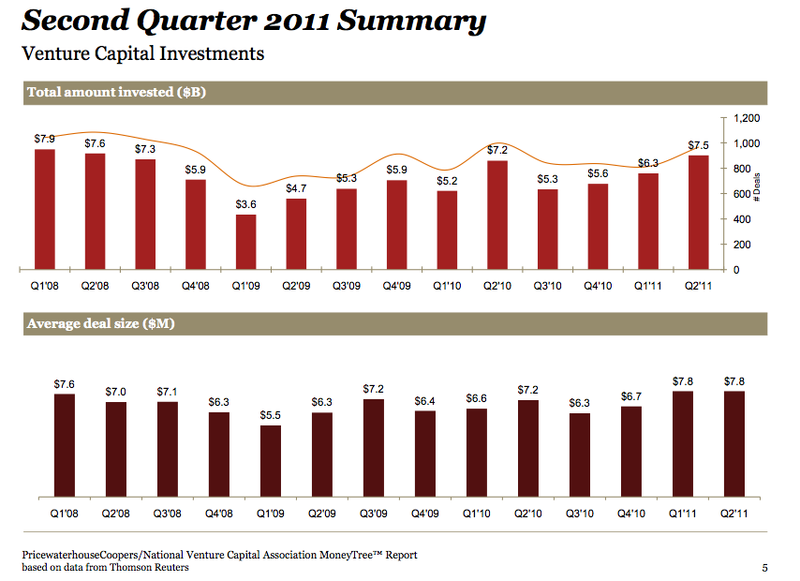 But some industry experts are saying that the current level of VC activity could be too good to be sustained. Venture capital firms have had difficulty raising new funds for several years now. And while there is a lot of talk about the recent splashy exits such as LinkedIn’s blockbuster IPO, the fact is that the current return on investment is still not as high as many VCs — or their institutional investors — would like. is it clear where capital is being injected? I wonder how the technology economy is growing in the UK, I know that it is something the government here feels fairly strongly about. Quite obvious that funding is high. We have been able to raise a small angel funds for both of our Wolf based database applications (www.wolfframeworks.com) with 20 odd customers from SV.